Free Award Winning Graphic Novel! Download this free graphic novel to enjoy! THIS GRAPHIC NOVEL WAS A 2016 READERS FAVORITE GRAPHIC NOVEL BOOK AWARD WINNER! 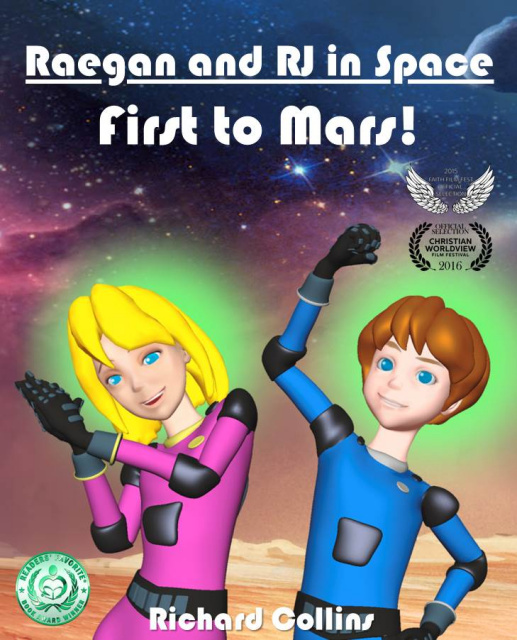 This graphic novel tells the story of when Raegan, RJ, and six of their friends, became the first humans to visit Mars! To download 'Right click' on the link and select 'save target as' and save it to your desk top to read any time you want! Note: If you have an extremely highly protective protection software on your computer it may not let you right click and download the PDF directly - you may have to left click and open up the GN, then save it to your desktop after okaying it through your software! To read without downloading 'Left click' on the link and wait for the file to load fully to open a read only file from this web site! Cover with Raegan, RJ on Mars! This is page 4 where Ms Sarah the science officer briefs the mission to Raegan and RJ and their friends! This is page 6 where Pastor Chris prays for the mission! This is page 18 where Raegan and RJ and their friends arrive at Mars! This is page 32 where Raegan and RJ and their friends are back on Earth after visitng Mars! Download this cool graphic novel now and enjoy!